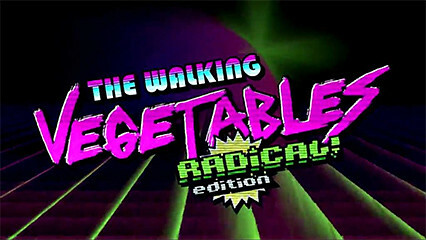 The Walking Vegetables: Radical Edition is a twin-stick shooter, which sees players battling a horde of zombie fruit and vegetables. It’s also a homage to the 1980s and uses a soundtrack that includes riffs from seminal 80s shows like Knight Rider and the A-Team, along with a pixel art style with shades of neon pink and blue, and an overhead viewpoint that was synonymous with gaming at the time. So are these mutated veggies enough to make you leek your lips, or are they carrotten? The Broccoliath is one of the first bosses you will face. The Walking Vegetables sees aliens landing in your city, and turning healthy greens into killer zombie veggies that attack on sight. The player is cast as a policeman, whose boss sees that “something’s strange in the neighbourhood” and asks you to sort out the problem. 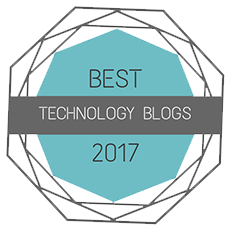 Your nameless avatar then leaves the safety of the police station – in a DeLorean, no less – to take down the marauding vegetables. 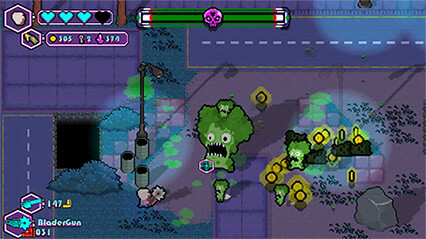 The campaign uses the title ‘No Peas on Earth’, and sees you starting off with a pistol with unlimited ammo and a police baton, as you work your way through the hordes of zombie veg. Once you take out all the enemies in the vicinity, you are free to choose a route to the next area of enemies. The vegetables don’t respawn, so when you clear an area you are free to explore. There are a few buildings, and a shop to unlock which sells ammo, weapons, and health packs to replenish your life bar. To unlock these areas you receive keys, ammo, and health from defeated foes, or from smashing up things like bins and pieces of furniture that are dotted around each area. You can also pick up more powerful weapons when you defeat a wave of enemies, and they drop a treasure chest full of goodies. Sometimes a portal appears in the level, which takes you to a bonus level. 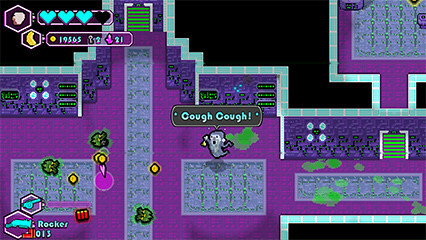 Here you have to survive waves of veggies gone bad, and pick up extra loot and weapons to aid you in your quest. Oooh, a shiny disco DeLorean! 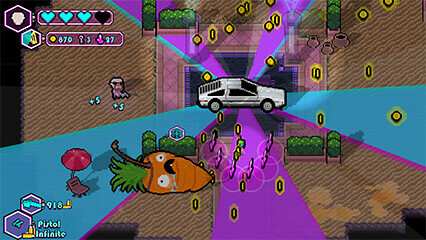 The game can get quite chaotic with lots of enemies on the screen at once, with carrots attacking quickly, while lemons drop acidic juice that drains your health, and some even shoot at you as well. Thankfully you can use your melee weapon to bat these shots back at your aggressor, which is quite satisfying. After you work your way through the level, you unlock the boss battle, which sees you facing off against enemies like the giant broccoli The Broccoliath, who sends out waves of mini broccolis at you, or the giant spewing coconut of Coco & Loco, and a few other giant mutant veggies and fruit, before you eventually take the fight to the alien mothership. These boss fights are all quite similar affairs, with a giant bad guy stomping around, occasionally shooting at you along with waves of smaller enemies, and it’s just a case of avoiding the enemies and gunfire, and shooting the big bad until its health bar depletes. Time to face the boss! Each playthrough is different, with randomised buildings, weapons, enemies and bosses, which helps keep the experience fresh each time. It can also be fiendishly difficult during boss fights at times, if you don’t have a decent weapon to hand; and if you die, the game puts you back to the start again, which can get quite frustrating when you’re making good progress. To negate this you can add special abilities to your locker, by completing specific tasks like defeating a boss, or using health packs when you have full health. You can also play the game with a co-op partner, which helps make the game a lot easier if you find yourself struggling. The game also doesn’t really give you much info on what you’ve to do, or where you have to go, when you start. We still don’t know what some of the items actually do, to be honest. 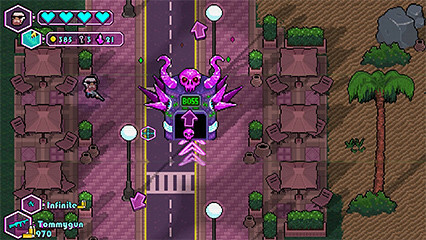 Buildings are unlocked by collecting keys from downed enemies or smashing items around the areas. We can’t fault the presentation of the game, which uses an appealing pixel art style, along with a neat VHS style filter to help give you that nostalgic feel of the 80s. Gameplay is solid, although it can get quite repetitive, and we’d like to have seen a bit more variety in the boss battles, which were all a bit too similar. While we could’ve come up with many corny puns for The Walking Vegetables, we won’t beet around the bush, as there isn’t mushroom for it here. You’ll have some fun here, just don’t expect salad gold.